ô Prices are available on request - info@silwerfontein.co.za. 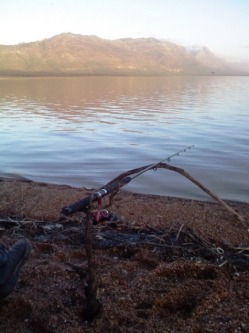 ô A permit needs to be obtained from the Farmhouse at Silwerfontein - a permit holder needs to be in possession of a valid angling license (inland water) – from Nature Conservation. ô All species of frogs are protected and may not be used as bait for fishing. 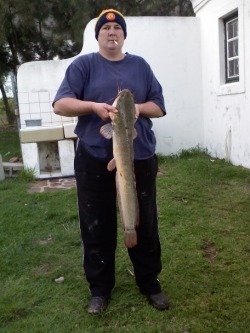 ô The allowed method of angling shall be by means of using a rod, reel and line. The using of hand lines should be avoided. It is however also deemed to be a legal method of angling. ô Only 2 (two) SMALLMOUTH BASS (Micropterus dolomieu) fish per angler per day may be killed. Any Bass weighing 1.5 kg or heavier shall be released back into the dam unharmed, immediately after capture. ô Any TROUT (Oncorhynchus mykiss), TILAPIA <KURPER> (Oreochromis mossambicus), TENCH (Tinca tinca) or WHITEFISH (Barbus andrewi) shall be released back into the dam unharmed, immediately after capture. 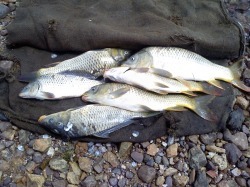 ô The permit holder is kindly requested to remove from the dam area and keep all CARP (Cyprinus carpio) and/or CATFISH <BARBEL> (Clarias gariepinus), caught. ô No live fish may be transported without a relevant permit. All fish have to be killed prior to removing them from the dam area. ô No dead fish or remains of cleaned fish shall be left in the water or on the ground. ô Strictly NO FIRES anywhere along the dam, except on sites specifically developed for this purpose. Camping is not allowed inside the Voëlvlei area. ô Do not litter. No discharging of cigarette butts. Any type of refuse created has to be removed from the area. ô The unnecessary disturbance of animals, birds or plants has to be avoided. ô Where possible, only existing roads or paths shall be used. Speed limits are 40 kph. The creation of paths through existing vegetation is not allowed. ô A permit entitles the holder to fish from the shore only. The use of any type of raft shall be deemed illegal. ô If used as sport permit, the number on any raft shall be VYC 6 (member of Voëlvlei Yacht Club). ô Instructions given by any authority (Voëlvlei Water Warden or DWAF or CNCB employee) shall be adhered to. ô On demand by an authority, this permit has to be produced. ô A permit holder is kindly requested to report (Tel 023 232 0531 or Cell 079 500 1906) any sightings of vandalism, dead animals or unusual animal behaviour or other things out of the ordinary, such as open gates, broken locks etc.